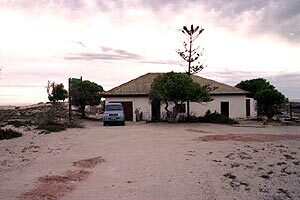 Nudists DXpedition is so named as it was at an isolated cottage on the sea often used by nudists. 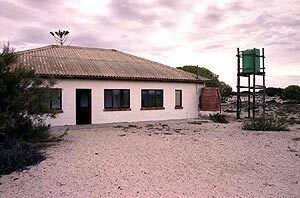 The cottage, owned by a farmer, is called Seefontein, an Afrikaans name for "sea fountain". It has no access to the public, as entrance is only through a locked gate with a key supplied by the farmer. The nearest power lines and electrical interference are 5 km's away at the seaside hamlet of Dwarskersbos, which is 15 km's North of the seaside town of Veldrif at the mouth of the Berg River. The cottage is right on the beach with a clear outlook towards North America over the Atlantic Ocean. The farmer supplies kerosene lamps for lighting and gas powers the hot water, stove and refrigerator. The water is horrible brown and brackish, so the farmer supplies a small container of pure water for drinking. It has two bedrooms and a long veranda overlooking the sea where the radios can be set up. Whilst I got the radio gear set up, my dear wife saw to our comfort and soon had the place functioning like a home from home. As there are no nearby habitations or anything, beverage antennas can be set up in many directions. I set up one on a bearing of 300 degrees (120 reciprocal) which was 1000 feet/300 meters long pointing directly at New York. I also set up my trusty Kiwa MW Loop, but had to play around with its siting a bit, as a low dune right on the beach blocked incoming signals a bit on the first night. For the next nights I repositioned it a bit higher and looking through a gap in the dune, then it performed as well and sometimes better than the 300 meter beverage. Even my wife is awed at the fact that this small device can clearly pick up such faint signals as the U.S. MW stations 14,000 km's and 8000 miles away. It is no wonder that the cognoscenti are prepared to pay up to US$560 for a preowned one. I have looked long and hard for a good DX site on our Atlantic ocean West coast, so was quite bucked at finding this isolated place. From here I went much further right up the coast, but there is no other such isolated cottage available for DXing right up to the Namibian border at the Orange River. I don't think propagation conditions were too good, as otherwise I would have expected more U.S. stations, and on the second night there was some heavy static from a large tropical storm front that could be seen in the evening with huge cumulo nimbus spectacular thunderheads. 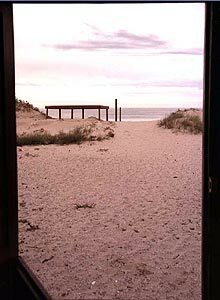 Outlook from the Seefontein nudists cottage that the Kiwa MW Loop sees as it looks directly towards North America. The nudists trip through the dune to the isolated beach in front, just 30 meters away. I got to wondering how many extra stations I was IDing on the Icom versus my old Drake R8B, and thought, quite a few, as there was heavy static from nearby storms which the Icom's NR noise reduction facility did a great job of clarifying and eliminating. Although in theory, US stations should have started coming in at 0000, in practice they only surfaced at around 0300 and my best catches were after first light at 0430 and my best ID recorded was at sunrise when the light was full at 0500. I was also quite bucked by the performance of my new (pre-owned) Sony MiniDisc recorder which did a great job of recording some of the more difficult ID's.